Looks like my first 3 from Masters of Malt. The bottle shape is different compared to the ones distributed in the US which is the same bottle used for Doorly's. Interesting. 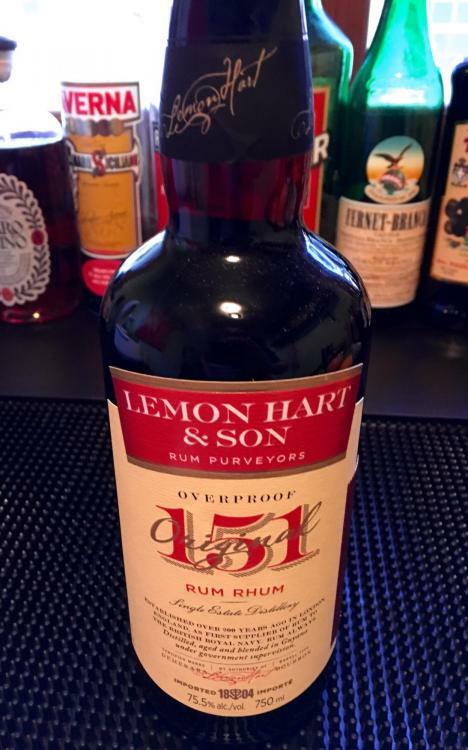 I have Hamilton 151 and some old Lemon Hart left. I read today with much delight that Lemon Hart is back in the US market. It would will be fun to compare the three 151's! Once more plenty of rum, more than I actually need... but a) it was a bargain and b) it's Caroni rum: grab some while you can. You have the old stock to compare against? I've never tasted either of the older labels of Lemon Hart: my interest in cocktails got serious only after the imports stopped. I bought a bottle of the Hamilton 151 a while ago and have almost worked my way through it, liking it a lot. When I got home I poured a shot of each (Hamilton and the new LH) to do a quick and dirty taste test, but it quickly became apparent that these are just too hot to drink neat with any discernment. I would say that the Lemon Hart burned with alcohol less—was a little smoother—thought that may just have been because I sipped it second. But maybe that tameness is connected to the disappointment your Instagram guy felt in the cocktail context. 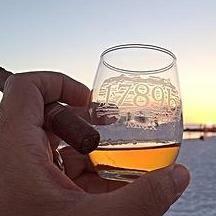 @Craig ESimply dilute each to a reasonable sipping proof (say 60-80?). 50/50 would end up at 75 proof, which would be easy to measure. Also, for spirits that are destined for a cocktail (as I suspect this is), maybe you need to very carefully make two cocktails that highlight the product. I tend to prefer bolder / rougher spirits in cocktails than I do neat. My local Trader Joe's no longer stocks Sipsmith (it was a steal at $29.99), but they had this Sonoma gin that smells pretty good. 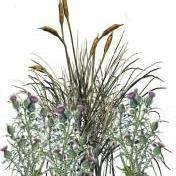 Uncle Val's botanical gin ($31.99). Uncle Val's is fun. Very cucumbery—more so than Hendrick's, I'd say. You are right, but at least they haven't forgotten the juniper! Okay, I sat down with two shot glasses of the rums diluted 1:1. 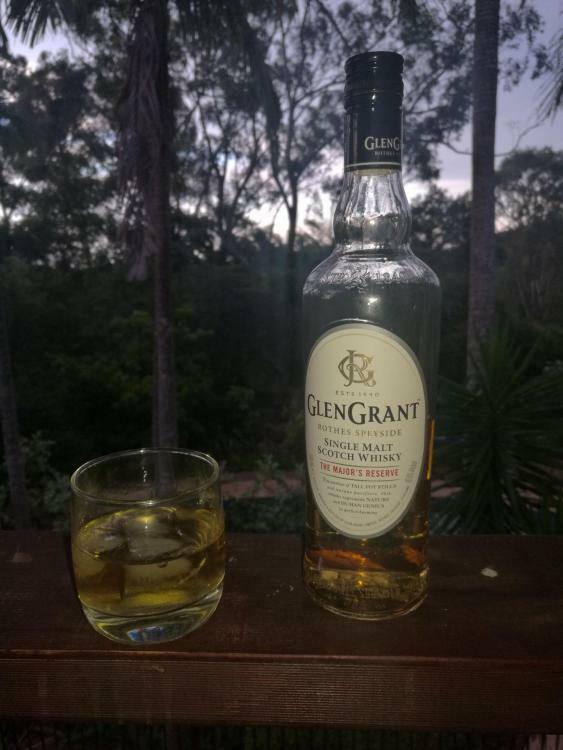 I'm not an experienced taster so take this with a grain of salt. At dilution, to my nose Hamilton 151 had an aroma of cognac and alcohol; new Lemon Hart was more subdued. The taste differed; I got brown sugar Pop Tart and overripe fruit. In the LH I think I got red apples. On the finish, Hamilton seemed "hot" in the temperature sense, a deep and long lasting warmth. LH seemed more "hot" in the spicy sense, black pepper. I think diluted Hamilton had more character, and for that reason that rum might well be superior in many cocktails. 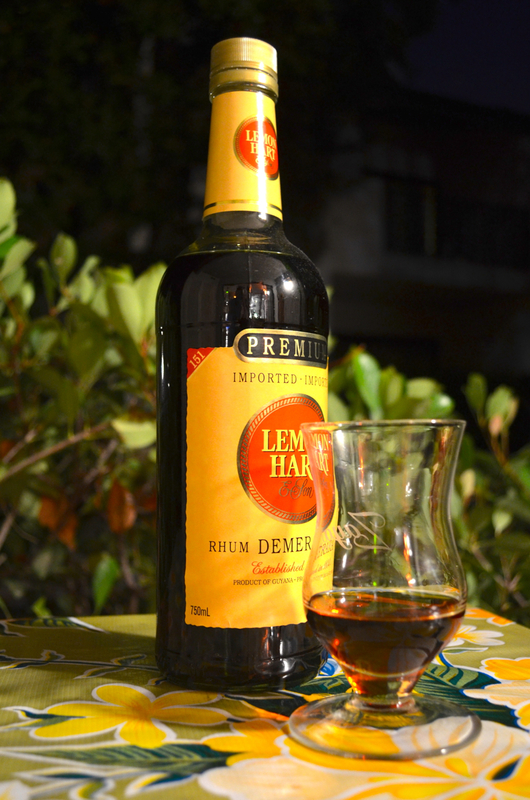 But both feel well crafted, not raw at all, and if the goal is to boost the octane of a cocktail while keeping it accessible, the smoothness of Lemon Hart might serve well. I'm curious how both match with the older bottlings of LH but I don't have access to those. I still have some older yellow label LH as well as the red label and Hamilton. Now I just have to find the new one! Haven't seen it in Atlanta yet but we aren't exactly on the front lines of new spirits debuts even though it seems to be all around us (Florida, Tennessee). All the talk on Tiki Central suggests each is a bit different in its own way (not really a big surprise). Since I still have a little of the earlier yellow label left it will be interesting to see how it stands up to the other three if and when I do find the new version. 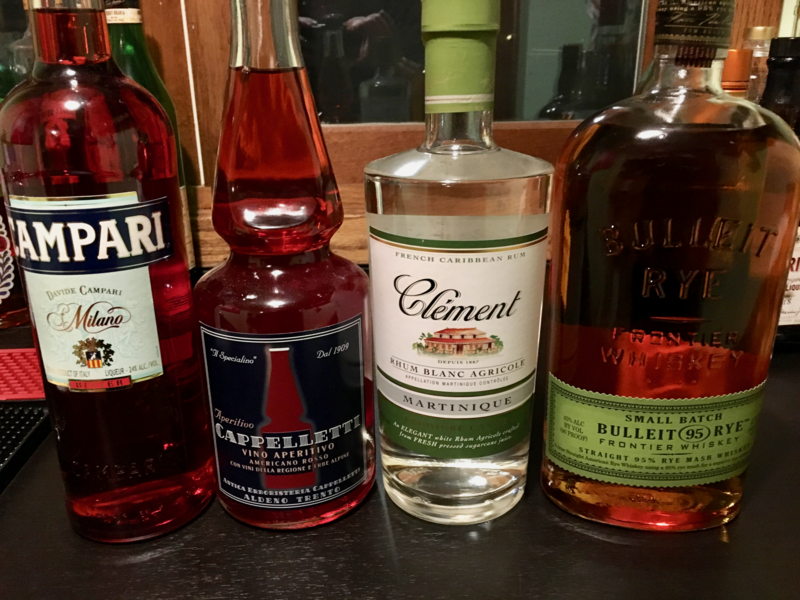 Campari's a restock, others are new brands to me. Newest arrivals from overseas and K & L.
Did the tax-man get into the Appleton 12? I can't remember what I bought that day, but sometimes I just like watching! This is Holiday Wine Cellar in Escondido, and it's only a small part of the selection. Rum. They didn't have the Hamilton I was looking for. I enjoyed this one the other night. 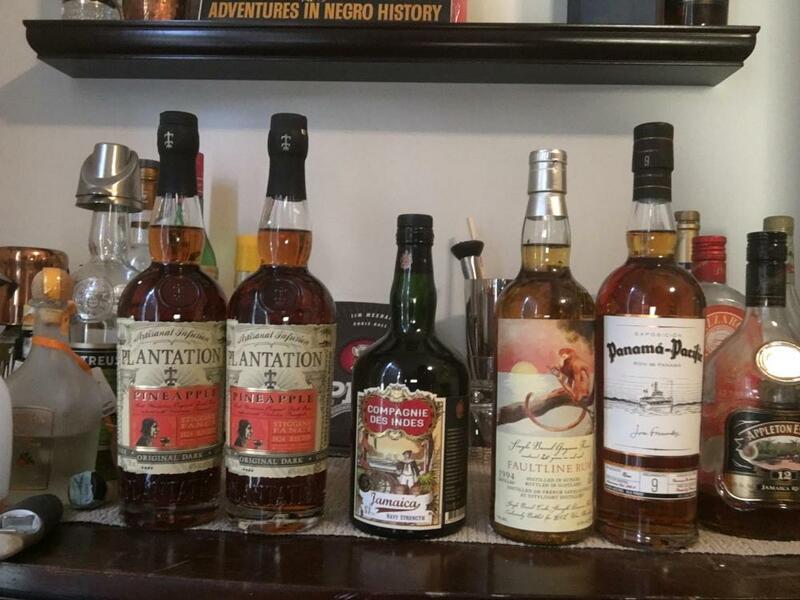 Had friends over for cocktails and they contributed these piscos. First I've ever owned, in fact first I've ever tried. 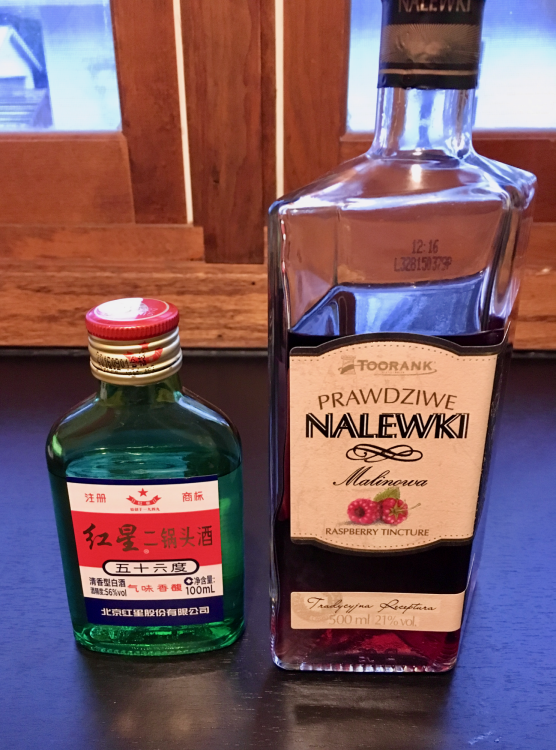 ...and more gifts from friends, one just back from China and the other just back from Poland. Not finding much online about how to use these in mixed drinks, so I'll have to be inventive. Suggestions welcome! You could try the raspberry in some sort of knickerbocker knockoff. Don't know about the Chinese one - maybe you can use it to run your chain-saw. Raspberry Liqueur is one of the ingredients in our own "Deco" that I have listed in the drinks thread, you could give that a try and let me know your thoughts. Back down to the Islands before Thanksgiving so it was a bit of deja vu all over again for me. Except for this time I managed to get to Marie Galante and tour Poisson and Bielle distilleries. Alas, Bellevue was just a bit too far especially since they all generally closed up shop at 1300 in the offseason. But I did pick up several rhums of interest! And I wish I had room in my luggage to bring back a few more. But I was limited to about 9 because glass is heavy! The Pere Labat 1997 from Poisson is allegedly an 18yo-ish rhum bottled last year but oddly is lighter in color than the 8yo next to it. But a very nice flavor as I got to taste pretty much everything at the distillery before buying. It was kind of like having an open bar! Bielle was similar with an opportunity to taste everything beforehand and had several cask strength offerings that I wish I could have brought. There was a very nice 2002 vintage but it was rather spendy. Instead I picked up another cask strength Rhum Rhum 2015 which was about half the cost of buying it at Astor (I just couldn't resist! ), the Bielle 40th Anniversary is barrel proof 7yo-ish agricole made to celebrate some anniversary or another and the Canne Grise which was a particularly unusual blanc rhum made from the gray species of sugar cane, rather like the Canne Beu that Clement makes. And speaking of Clement Canne Bleu I managed to stumble upon a 2009 vintage in St. Lucia along with a 2014 vintage of 1931 from St. Lucia distillery (I picked up the 2013 vintage last trip), a 10 Cane from Trinidad which has since been discontinued that was an impulse buy (that I kind of regret now as it took up potential space for another bottle). We also had the chance to tour Depaz in Martinique where I picked up the 2002 vintage agricole that was bottled in 2013 so is about 11yo.